MX-E3T3-F carries 16x E1/T1 and Ethernet traffics over an optical line with 1+1 protection. It suits many telecoms operators, defense, utility requirements for E1/T1 line extension and distribution. MX-E3T3-F has two optical ports for 1+1 redundancy that can be equipped with a large choice of mono-mode, single-mode and CWDM SFP modules. 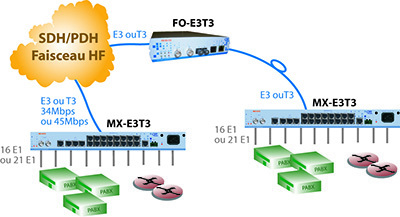 MX-E3T3-F can operate with the FO-E3T3 and the MX-E3T3-C to extend a Microwave or a SONET/SDH network. It embeds a 3x ports Ethernet switch sharing an optical bandwidth of 45 Mbps. MX-E3T3-F comes as a 1U / 19'' enclosure for the RJ45 / 100/120 Ohms interfaces, and a 2U high format for the BNC 75 Ohms model. It has a choice of single or redundant 110/230 Vac and 48 Vdc power supply options.